The MINI Punch and Die Grinder (rotary table surface grinder) is an ideal addition to turret and punch press cells for in-cell tooling maintenance with 110V or 220V 1-phase power service. Re-grinding of punches and dies by the cell operator is simple, quick, and easy. 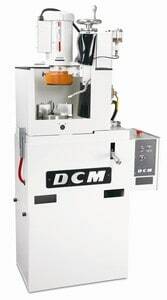 The MINI uses vertical spindle rotary table grinding action, coupled with a CBN superabrasive grinding wheel to sharpen tools to “as new” condition and performance. It is sold as a complete package with manual feed control, coolant system, self dressing CBN grinding wheel and a universal fixture that accepts Amada, Trumpf, Strippit, Finnpower, Weideman, Whitney, and other style punches and dies. An optional angle fixture is available for rooftop and shear angle type tooling. An optional center mount magnetic chuck, and a variety of abrasive options are also available for alternate applications.